A couple of new things to share today. 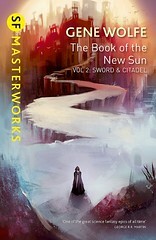 First off is a Between the Cover Podcast interview with Gene Wolfe. The interview is done by John J. Miller and is, as almost every interview with Mr. Wolfe, an insightful one that glimpses into his life and personal interests. The other item of interest is a new forum called “Useful Phrases” that is dedicated entirely to discussing Gene Wolfe’s work and life. It’s always great to see new additions to the Gene Wolfe online community. If you want to be involved simply go to the site, make a quick account and start posting. Both of these sites have added to the new Hoof & Hide Delicious.com repository of links. Very soon I’ll have some new updates involving the resources page and upcoming Twitter updates!